The final day of the PokerStars.net Eureka Poker Tour Rozvadov €1,100 Main Event saw eight players out of a 682-entry field return to the tables of King's Casino in Rozvadov. Seven different nationalities were represented at the final table nestled in the largest poker room in Europe, but it was Argentina that proved strongest with Ivan "Negriin" Luca taking top honors for €106,186. 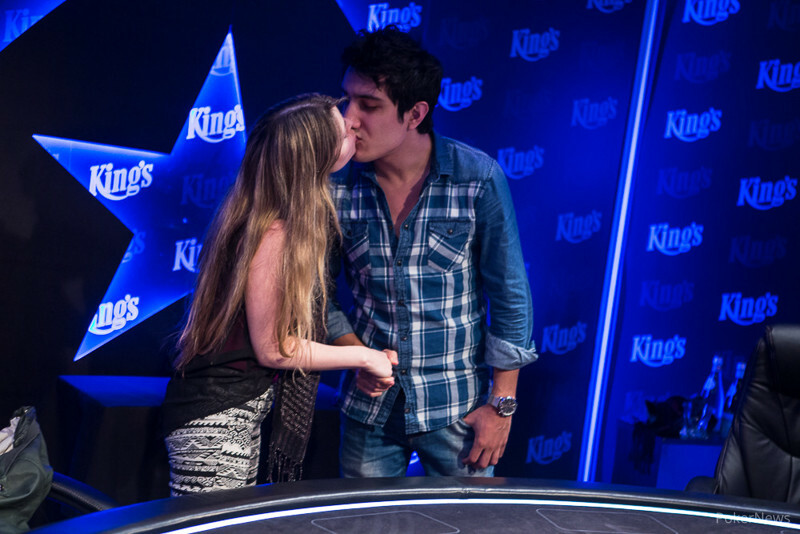 Luca faced his girlfriend, Maria Lampropoulos, in heads-up play for the title on International Women's Day, and the couple battled for 90 minutes. During that time, Luca had increased to a dominating lead, and then sealed the deal when he made a flush on the river to emerge victorious. It all started with a bang, or even several bangs, as one hour had gone by and just three players remained. Hannes Speiser was gone in the very first hand when he got his short stack in with the and Luca called out of the small blind with the . The board ran out and Speiser was eliminated in eighth place for €12,500 after only 90 seconds of action. On Hand #4, Lampropoulos min-raised and Luca flat-called with a pair of eights before Robert Kokoska three-bet jammed on the button. Lampropoulos quickly called with the , Luca folded, and Kokoska's was drawing dead on the turn of a board. Just one hand later, Mick Heder became the next casualty. The Dane three-bet all in with the and initial raiser, Luca, snap-called with the . Heder picked up some outs on the flop, but neither the turn nor the river were of any help. The early madness was complete with the bustout of Stoyan Stefanov in Hand #7. David Urban min-raised from the cutoff seat and the Bulgarian jammed 22 big blinds from one seat over with the . Urban snap-called with the to spike both over cards on the flop. After the turn and river, Stefanov was eliminated in fifth place for a payday of €33,100. Around one hour had passed before Peter Siemund was sent to the rail in fourth place. The German raised and called a three-bet to see a flop of . Urban's continuation bet was just called, and the Slovakian then jammed the turn to put the Berlin-based player at risk for just over the size of the pot. Siemund called and flipped over top pair with the . Urban had the for a gut shot and ace high. The river gave Urban the better hand and the chip lead three-handed, while Siemund exited in fourth for a payday of €41,500. What followed was an endurance challenge of almost five hours, including breaks. Several times Urban pulled away from his two opponents before then paying off a costly over-bet with pocket jacks. Luca showed the for slow-played trips on the turn and a rivered full house. Urban never recovered from that set back and Lampropoulos kept hitting a lot of hands against him to send the Slovakian on a short stack. Down to less than 12 big blinds, Urban shoved out of the big blind into two limps with his and Luca snap-called with the to set up the all-Argentinian heads-up match after a board of . A deal was made and a sum of €5,000 was left aside to the eventual winner. Luca started heads-up play with a slight lead, but was not getting an easy ride from his girlfriend. In fact, Lampropoulos pulled into the lead twice before losing the momentum again. In the last hand, a limped pot saw her bet the turn with the . The straight was completed after the fell on the river, but Luca made a flush with the . Lampropoulos bet and then called a shove to bust in second place, and that was all she wrote. A payday of €95,404 was awarded to Lampropoulos and became the highest of her career. She came second at the World Poker Tour National Brussels last month for €68,200 for another impressive score, but the spotlight here was all on Luca, as the 23-year-old added another title to his impressive résumé, which already boasts more than $2.8 million in tournament cashes. That ends the PokerNews coverage here in Rozvadov. Thanks for tuning in, and we'll see you at the next stop on tour! The final hand at the end of the level saw Ivan Luca limp in for 250,000 with the and Maria Lampropoulos checked her big blind with the on a stack of 4 million chips. Both checked the flop and Lampropoulos then bet the turn for 300,000. Luca made the call and found the magic river to make a flush, the same card gave Lampropoulos also a straight. She bet 800,000 and Luca took his time before shoving and getting the call by his girlfriend. Lampropoulos has been eliminated in 2nd place for a career-highest payday of €€95,404. 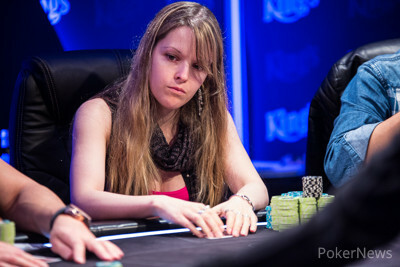 Maria Lampropoulos raised to 825,000 preflop with and Ivan Luca flat-called with his . On the flop both players checked, as did for the turn. On the river, Lampropoulos faced a bet worth 625,000 by Luca and again the table chat provided no answer to see her fold. Ivan Luca picked up another hand with and then Maria Lampropoulos found a pocket pair in . The min-raised pot went to the flop and Luca checked his for top pair. On the turn, Lampropoulos check-folded to a bet of 700,000 and fell down to around 5 million chips. 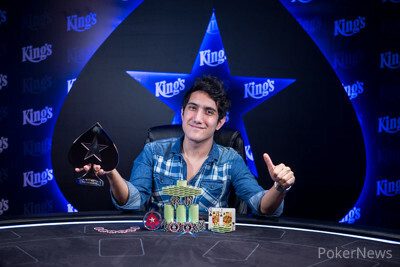 Ivan Luca raised to 600,000 with the and Maria Lampropoulos called with the to see a flop of . Lampropoulos check-called a continuation bet worth 750,000 and did so again for 1,400,000 on the turn with her pair and a gutshot. The river saw a check by Lampropoulos and Luca shoved for 4,575, under pot size. Both started small talk and Lampropoulos was trying to get any kind of information while they chatted in Spanish. Ultimately she folded and Luca cheekily flashed the , the hand itself took more than 10 minutes. The new level started well for Maria Lampropoulos, as she picked up and min-raised to 500,000. Ivan Luca defended the but quickly folded to a continuation bet on the flop. Ivan Luca limped in with the and Maria Lampropoulos raised to 825,000 with . Luca called and checked behind the flop before Lampropoulos' bet on the turn won the pot without further resistance.